My first aquaroom was in a loft room in the house of my childhood. It was a small room without water and drain. A room like that is very difficult to combine with aquarium and loot of water. I was carrying every liter with water from our apartment in the second floor to the loft. I was young and after some time I begun to feel more strength in my arms and body. Very often I open the window and drain the water from my aquariums that way. 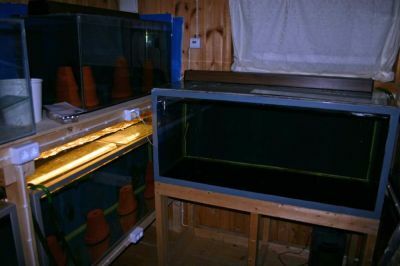 This was the main place for me in three years in breeding aquarium fishes. 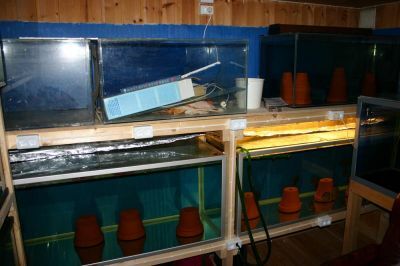 Before I got the room like the picture I started with only 4 plastic 10 liter aquariums in 1967, but very soon it begin to come more and more 40 – 80 liters aquariums. 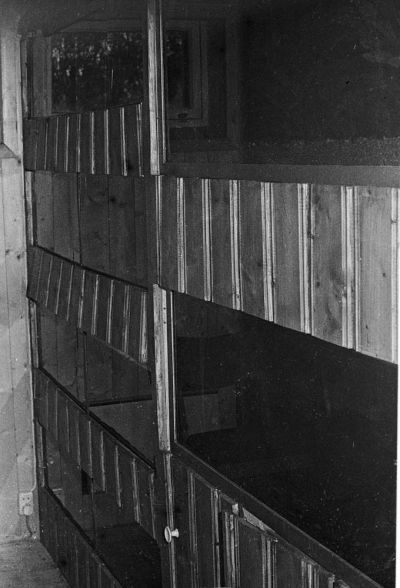 About 1969 I begin to building shelf and in 1970 -71 the room was complete like the picture. Then I also have got some bigger aquariums from 100 – 250 liters. In this room I was breeding many spices and had glory times of my youth years. All how happen in this room was the main part of my life and I was only living for breeding my fishes. What a glory time, I still remember many episodes and it is easier to remember because I was shouting pictures in my aquariums. In the weekend I often was sitting in front of the aquariums and shouting pictures during the night when the fishes were breeding. So this room I spending very much these years, maybe too much because I sometime (often) forget to do my home work. 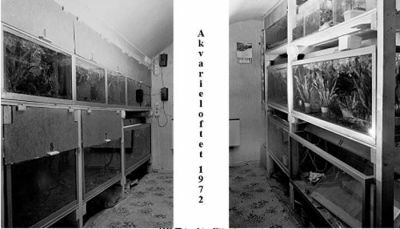 In 1973 I was selling much of my small aquariums and moved rest of them to a new aqua room in the basement in our house. Through the fall of 1972 my interest were changing to Malawi cichlids. So I want new and bigger aquariums. 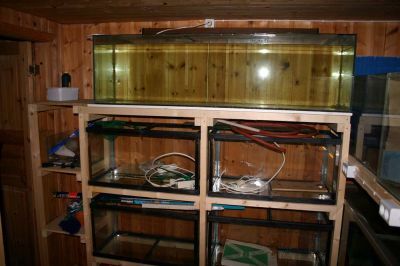 I was making 2x560, 6x120 and 4x60 liters aquarium. From the loft room I had 2x250 liters aquarium. In the picture we see rack for all aquariums from 60 to 250 liter. On opposite side it was a rack for 2x560 and I have make plans for two more 600 liters aquarium how never came in the basement. But still I have 2580 liters for my Malawi cichlids, how gave very much work. In 1979 I demolish the shelf places from 1973. I was building new mobile rack for my aquariums in fibred building board. I was preparing for in the future to move to my on flat. I make a rack for 6x50 liter, one rack for 300 and 2x 150 liter. I also made a 500 liter with table and shade in fibred building board. I was using this rack in the basement to 1983 when I moved to a flat with all the racks. From 1981 - 1983 I was working very serious with trying to get my Discus to breeding. But it was very much disappointment in this. At last the male of the couple died and the hole end sadly for me. Look into my Discus pages. My flat was very little and with all the aquariums it was more like an aquarium room. I continue to work with trying to breeding Discus, but I have to little and small aquarium and was not able to store water for changing to the Discus. So in this period I was breeding some small cichlids. 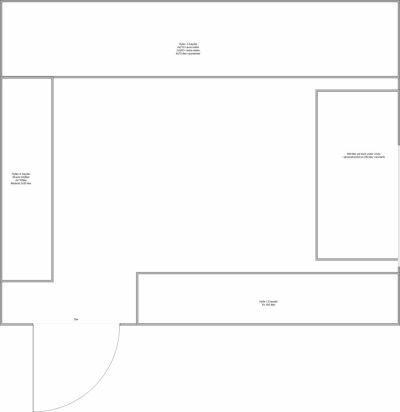 In 1985 I was buying a flat with a big and a smaller room in the basement. This became the new aqua rooms for me and in 1986 it was complete with 57 aquariums in total 8000 liter and in my living room it was an aquarium of 500 liter. So this is the biggest aquarium period in my life. I was breeding more than thousand scalar and many other fishes in this rooms, but still I not have success with breeding Discus. In 1993 I was moving to a flat and take one of the small bedrooms as aqua room. The room consists of one 560 liter, 360 liter and 4x80 liter for storing change water. I was also putting up a rack of small aquarium for breeding some tetra species. I had also some bucket for storing changing water in the washroom.In this I set up some of my olds aquarium from my last aqua room. This time I want to work with Discus and try to breeding them. From 1993 to 1997 I had success with this and had many breeding’s of blue and brown Discus. This was the goal of my aquatic career. Summer of 2006 I stared to make a new aquaroom in the basement of the house I was buying in the spring same year. 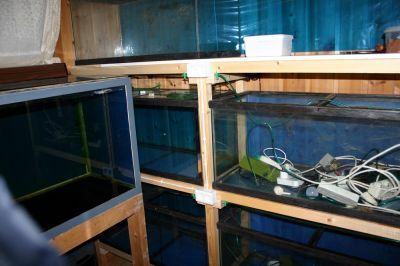 I began to planning aquarium rack in a room 8m2 like the figure. It was space for a rack 4x540 liter or 2x540 and 3x250 liter, second rack 6x160 liter and 560 liter single aquarium. I was also planning a rack for small aquarium in the room. In Mars 2009 it was a leakage from one 540 liter aquarium. 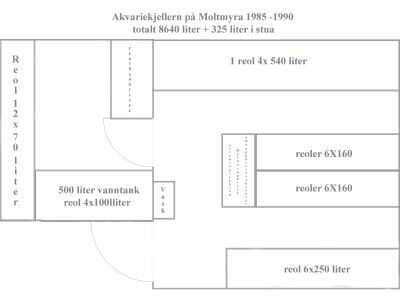 I had to remote the room and in the summer 2009 I could move back the aquarium's to the room but now it was 3x250 and 2x540 liter in the big rack, but still 6x160 liter in to opposite rack. The big single 560 liter and the opposite rack of 4x100 and 250 liter are gone away. I have replaced them with other aquariums. Total it is about 4000 liter water in all the aquariums in the aquaroom. I have also two 530 and one 170 liter aquariums in a living room in the basement. So total it is more than 5000 liter aquarium water in the basement in 2010. This is my play ground the rest of my times as a aquarist. All aquariums have separate filter system and I use some of the aquariums as storage for changing water. All the time since 2006 my main interest has been wild catches Discus. 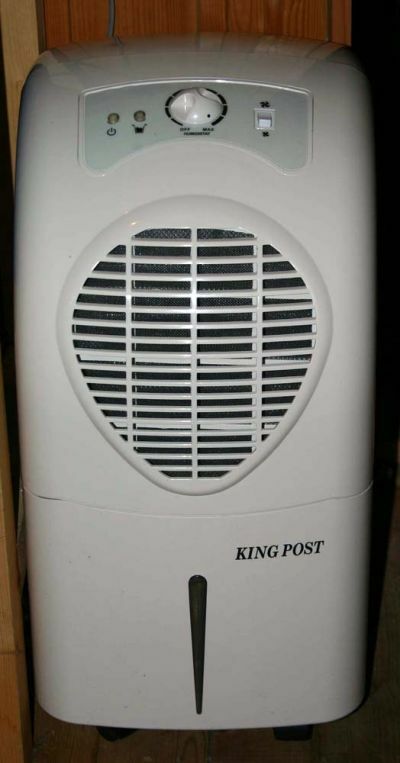 I am also using dehumidifier for the air in the basement to take out 10 liter water from the air every 1-2 days. This is very important to save the house from serious damage of the humidity from all the aquariums I have in the basement. Today, there have been 35157 visitors (90851 hits) on this page!